then these simple Almond Butter Sugar Cookies are for you, baby. No rolling and cutting necessary. Top them with a heavenly cream cheese frosting and you will be in a happy place, I tell you. You can, of course tint the frosting any color you would like. This little pink number I’ve got going on would be great for a little girls birthday party or baby shower. Color the frosting orange for Halloween or perhaps red and green for Christmas goodies. I baked up a batch, left the frosting white and decorated them with candy to make some cute Christmas themed cookies. You can find that post here. Alrighty, let’s make some cookies. 1. Cream your butter and sugar together for at least 2 minutes. 2. Add your eggs, vanilla, almond extract and butter flavoring. Beat the mixture for another 2 minutes or until everything is nice and fluffy. and salt. Stir it around to combine. 4. Add the dry ingredients to the creamed mixture and mix until combined. 5. Roll into 1 1/2 inch balls and place on a cookie sheet that has been sprayed with cooking spray. 6. Bake at 350 for about 7 minutes of until the tops of the cookies start to crack. Take them out of the oven and let them continue to cook on the hot sheet for several minutes. 7. Remove the cookies and place them on a wire rack to cool completely. 1. Place the cream cheese and butter in your stand mixer, or large mixing bowl. 2. Beat it until the two are well combined and nice and smooth. 3. Add the powdered sugar, milk, vanilla and dash of salt. Beat well. Add a bit more powdered sugar if it’s too thin, and more milk if it’s too thick. 4. Add a few drops of food coloring and mix it in. 5. 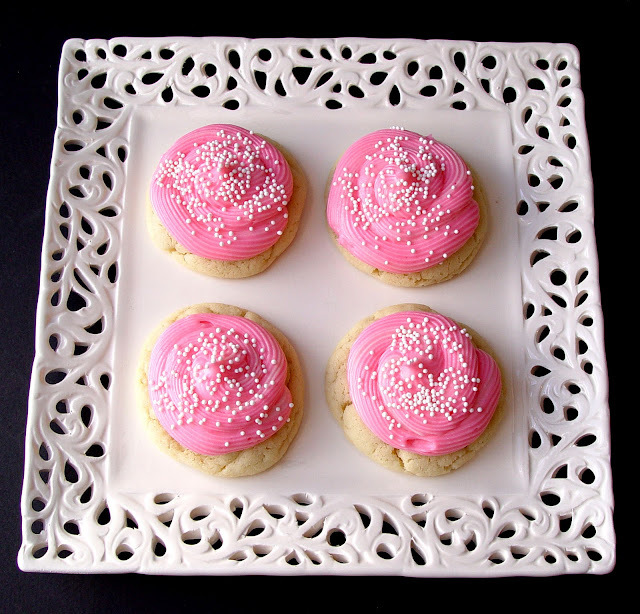 Pipe the frosting on to your cooled cookies and top with sprinkle. Oh, thank you!! I will have to try these out. The copycat Lofthouse cookie recipe I have requires all those steps you mentioned at the beginning of your post. I must try out this recipe. I made these yesterday, and they were P-E-R-F-E-C-T. I made one batch of cookies, rolled the rest of the dough into individual balls, flashed froze them, and then transferred them to a bag for future consumption. I also used regular buttercream instead of a cream cheese kind. Thanks for a great recipe! What a small world! Tell your husband and his family hello for me. Thanks for your kind words about my site. So glad the recipes have been turning out well for you. Have a good one! I am making these as I speak, but my mixture is too soft to roll into balls. So, I just dropped onto cookie sheet and baked. Not sure what I did to not be able to form into balls by hand?? Any thoughts? Sometimes if you let your butter get too soft, the dough can be sticky. When this happens popping the dough into the fridge for an hour so will help. Dropping them onto the cookie sheet also works well. 🙂 Hope they still tasted good. My cookies turned out flat as a pancake. Not sure what I did wrong. Any suggestions? Hope you love the cookies! You can leave the butter flavoring out, they won’t be quite as rich, but still really good. Good luck! These are so pretty! I want to try these when I get over this headcold! Do these need to be stored in the fridge since there is cream cheese in the icing? Wat happens if you can’t find almond extract? Can I just use more vanilla? The almond extract gives it another layer of flavor, look for it in the spice section of your grocery store. If you can’t find it…:) give it a try with just the vanilla. Good luck! Hope they turn out great for you! These are AWESOME!! I made them for a last minute dessert yesterday and I am addicted. 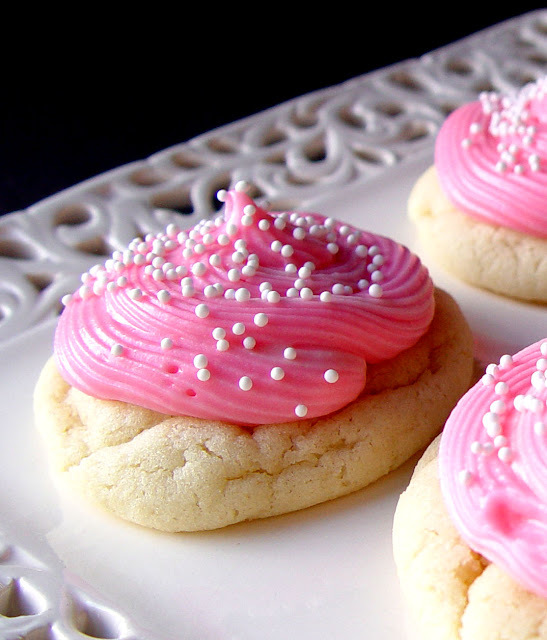 I have decided to forgo the cut out sugar cookies this year and make these instead. They are moist, soft, yummy and the frosting is great too. I did not have butter flavor so I upped the almond and vanilla but I think I could have just skipped it altogether. Thanks for the great recipe – I am definitely sharing it. Can I substitute a maple flavoring for the almond? would that go good with the vanilla? Hello! These cookies are so yummy! The icing was yummy too, but it turned out more like a glaze?? I didn’t end up using it for the cookies and used buttercream instead. What did I do wrong? I would love to figure out the icing because I love the cream cheese taste. just made them today and they where yummy indeed, thank you. What type of flour it has to be?? All-purpose flour? Thank you! They look yummy! Can’t wait to try them! All purpose flour will work perfectly for you. Hope you love them. I made these tonight for a practice run before my son’s first birthday. They were delicious! I did not make the icing and really think the cookie is great on it’s own. I’m sure they will be a bit hit at the party! Since discovering this blog I realized that I can actually cook and bake to the joy and delight of my family. So thanks. That being said, I’ve made these cookies and also added strawberry and orange extract – in different batches, and my family liked it. Gave it something extra, and they also like them without the icing. they are that delicious. thank you again. hi, I was just wondering what the butter flavoring was? I can’t find it at my local grocery store, or is it like the popcorn flavoring stuff? thanks! Just found your site today. Trying out some new things to bake this year. Let me tell you this site has made me very happy. As to this particular recipe I was wondering if you used salted or unsalted butter? Thanks in advanced and keep posting these wonderful things! So pining this! Just made these for a friends baby shower. I’ve made this recipe several times and they are amazing! What do you think about using this recipe to make heart shaped cookies? Maybe if I got it really cold and rolled it and cut it? Or do you think this recipe won’t work?